Radiologists are playing an increasingly important role in delivering personalized care, a development emphasized by the theme of the 96th Scientific Assembly and Annual Meeting of the Radiological Society of North America (RSNA 2010) — Personalized Medicine: In Pursuit of Excellence. “Radiology can play a central role, helping evolve and shape this emerging vision for the benefit of cancer patients,” noted Sanjiv S. Gambhir, MD, PhD, Molecular Imaging Program at Stanford (MIPS), Department of Radiology and Bio-X Program, Stanford University. In his presentation, Strategies for the Earlier Detection of Cancer, Dr. Gambhir identified new imaging strategies for studying basic cell and molecular biological events to identify disease at earlier stages. Helping to drive radiology’s evolution toward personalized care are several new advances in medical imaging and imaging informatics (IT), which were on display at RSNA 2010 in Chicago. GE Healthcare (Chalfont St. Giles, U.K.) highlighted Veo, its latest solution to CT radiation dose reduction. As a model-based iterative reconstruction (MBIR) technology, Veo’s new modeling techniques are designed to deliver lower noise and artifact suppression, provide resolution gain, and improve low-contrast detectability. The technology is available in Europe and is 510(k) pending at the FDA. GE also emphasized its dose-reduction innovations with its Adaptive Statistical Iterative Reconstruction (ASiR) solution, a low-dose reconstruction technology engineered to reduce dose by as much as 40% to 50% while maintaining image quality (Figure 1). 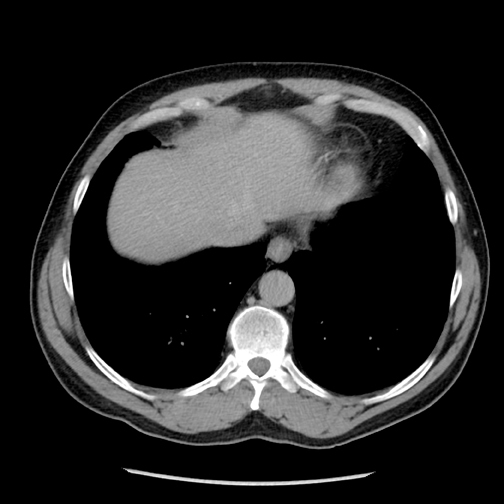 Ingenuity CT is a new platform from Philips Healthcare (Andover, MA) designed to enable clinicians to reduce dose by up to 80 percent while maintaining diagnostic image quality and improving spatial resolution. The system is engineered to generate low-dose diagnostic images with detailed visualization of bones at the same quality as full-dose images. As part of its goal to reduce radiation exposure to 2 mSv in typical CT exams, Siemens Healthcare (Malvern, PA) announced it will soon release FAST CARE, a solution to shorten exam times and lower dose. Fully Assisting Scanner Technologies (FAST) is a new processing support program. Combined Applications to Reduce Exposure (CARE) is a new dose reduction solution that automatically displays dose distribution for the planned examination. Together, FAST CARE will be available for use on the SOMATOM Definition AS and the SOMATOM Definition Flash scanners in 2011. CARE adds to the company’s initiatives to provide CT dose reduction solutions, including Iterative Reconstruction in Image Space (IRIS), a new method for the reconstruction of CT images designed to reduce dose. Toshiba America Medical Systems (Tustin, CA) introduced 160-detector-row helical scanning, which is the helical scan mode with the largest number of detector rows. Designed for the Aquilion One, the CT system can image the entire chest, abdomen, and pelvis in less than 5 seconds, or 2.5 times faster than 64-detector-row imaging. This technique is designed to reduce motion artifact to produce quality images. Toshiba also highlighted Target CTA and Adaptive Iterative Dose Reduction (AIDR), extensions of its dose reduction technologies. AIDR, pending FDA clearance, is software that iterates noise out of the image to increase image quality and lower radiation dose (Figure 2). GE Healthcare (Chalfont St. Giles, U.K.) introduced the redesigned Discovery MR750w with a 3.0T magnet, zero-boil off technology, 70 cm 3 130 cm patient bore with dual-flared 78-cm aperture openings, and a 50 cm 3 50 cm 3 50 cm field-of-view volume. Also on display at the GE booth was the Optima MR430s, a compact 1.5T system; the Optima MR360, a 1.5T whole-body MR with two detachable and one fixed table; and the Brivo MR355, a 1.5T whole-body MR with a fixed table. The systems have a super-conducting CXK4 magnet with zero boil-off technology. The company has several 510(k) pending MR coils within its GEM Suite, which includes a set of receive-only radio frequency (RF) surface coils designed for use with the Discovery MR750w 3.0T system and the Optima MR450w 1.5T system. Of its non-contrast solutions, GE demonstrated 3D arterial spin labeling for quantitative brain perfusion assessment. The technique can be used on pediatric patients and those with reduced renal function. Lantheus Imaging (N. Billerca, MA) touted the release of ABLAVAR (gadofosveset trisodium), an FDA-cleared MRA blood pool imaging agent used to evaluate aortoiliac occlusive disease in adults with known or suspected peripheral vascular disease. The agent is administered in a single, low dose—in line with the recent update to the ACR manual. The Ingenia MR system from Philips Healthcare (Andover, MA) is a digital broadband MR system, which supports digital signal acquisition and processing directly in the RF receive coil nearest to the patient. By providing a consistent digital connection throughout the entire MR scanning process, the system is designed to generate up to a 40% improvement in signal-to-noise ratio. The system is pending 510(k) clearance. Siemens Healthcare (Malvern, PA) highlighted productivity enhancement technologies on its MR systems with Tim 4G and Dot (day optimizing throughput). Tim 4G combines ultra high-density coils with 48 RF channels. The Dot engine offers a customizable framework for patient personalization, user guidance, and exam automation. Both technologies are available in the MAGNETOM Aera 1.5T and Skyra 3T MR systems. Toshiba America Medical Systems (Tustin, CA) introduced a new Vantage Titan 3T MR system designed to improve patient compliance and comfort and to enable advanced techniques. The open bore has a 71-cm aperture designed to reduce claustrophobia in bariatric patients. Toshiba’s Pianissimo noise-reduction technology works to reduce exam noise by up to 90%. 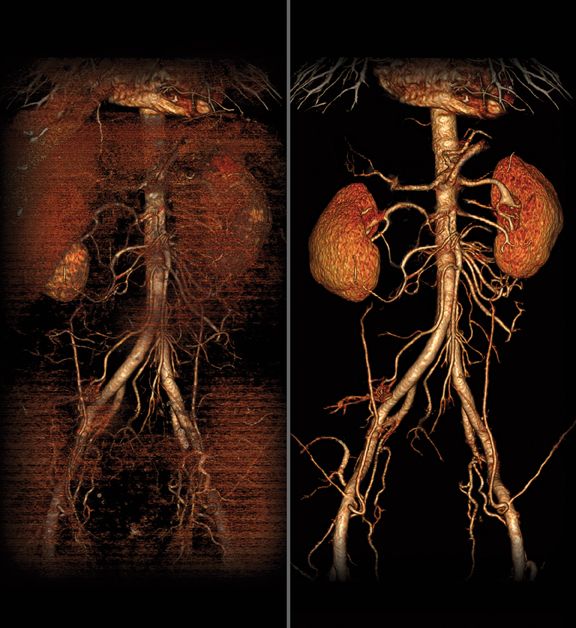 With the Vantage Titan, radiologists can perform several contrast-free MRA techniques, including fresh blood imaging (FBI) for evaluating peripheral vascular diseases of the lower legs and extremities; contrast-free improved angiography (CIA) for easier visualization of smaller vessels; time-spatial labeling inversion pulse (Time-SLIP) for evaluating hemodynamic, functional assessments, and visualization of vascular structures; and time space angiography (TSA) to create non-contrast time-resolved imaging with high temporal resolution (Figure 3). The Vantage Titan 3T MR is pending 510(k) clearance. GE Healthcare (Chalfont St. Giles, U.K.) announced the installation of a positron emission tomography (PET)/CT and MR imaging (MRI) platform called PET/CT +MR. The integrated sequential two-room PET/CT, MR scanners can be used in parallel or patients can be scanned on independent systems. An image registration application runs on GE’s Advantage Workstation, allowing a patient to be moved from one device (PET/CT) to the other device (MR) without changing positions on the table. GE also announced its first shipment to the United States of the Discovery NM/CT 670, a single photon emission computed tomography (SPECT/CT) system. It combines nuclear medicine detectors, a newly designed SPECT gantry for greater positional flexibility, and GE’s BrightSpeed Elite 16-slice CT. The system is engineered to shorten acquisition times and to improve dose management. Philips Healthcare (Andover, MA) presented its approach to whole-body PET/MR with a system that integrates the molecular imaging capabilities of PET with the soft tissue contrast of MRI. A rotating table maintains patient position as the patient undergoes an MRI study and a PET study. The system is pending 510(k) clearance. Another molecular imaging advance from Philips is the Ingenuity TF PET/CT. 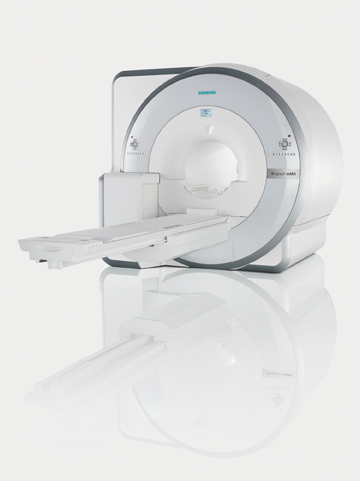 The hybrid system is designed for studies in oncology imaging, cardiac perfusion, and diagnostic CT. The system includes the same features of the Ingenuity CT platform, including dose-reduction technologies. Siemens Healthcare (Malvern, PA) introduced Biograph mMR, the first integrated whole-body molecular 3.0T MR system with simultaneous data acquisition technology. Clinical applications include identifying neurological, oncological, and cardiac conditions and planning therapies. Initial research suggests the system can scan the entire body in as little as 30 minutes for the combined exams (Figure 4). The Biograph mMR system requires 510(k) review by the FDA. Due to regulatory reasons its future availability in any country cannot be guaranteed. Barco’s (Kuurne, Belgium) Coronis Fusion 10MP display system for diagnostic grayscale imaging aims to enhance precision in reading grayscale images. With 4096 2 2560 resolution for grayscale studies, clinicians can read chest, bone, and breast imaging exams. IPS WideView LCD technology enables viewing from several angles and is designed for multi-user viewing (Figure 5). Carestream Health (Rochester, NY), introduced eHealth Portal Services, a new cloud-based service that allows healthcare providers to remotely access medical data. eHealth Archive Services users are able to share data and collaborate with imaging centers, radiologists, referring physicians, and other healthcare providers. InDex Image PHR by InSite One (Wallingford, CT) took center stage at RSNA 2010 by operating as a clearinghouse in a patient medical record exchange demonstration, which is part of a 2-year, NIH-funded project developed by the RSNA and the National Institute of Biomedical Imaging and Bioengineering (NIBIB). As cloud solutions integrate radiology systems with the healthcare enterprise, MedWeb (San Francisco, CA) touted the ease-of-use of its Medweb Cloud, a cross-enterprise, cross-platform archive that supports the creation of a master patient index (MPI). The cloud archive is designed for use with specialty-based telemedicine and information management applications, including teleradiology, PACS and RIS, and uses industry standards, such as DICOM, HL7, IHE, and XDS, to share patient data across healthcare facilities and systems. Nuance Communications (Burlington, MA) launched PowerScribe360, a platform that combines the speech recognition engine Dragon Medical, and is designed for core radiology reporting with options for critical test result management (CTRM), external data capture, multisite workflow support, and structured reporting. Radiologists, referring physicians, and specialists can review imaging exams simultaneously on the IntelliSpace Portal by Philips Healthcare (Andover, MA). The new platform offers Collaborator, a medical networking solution that allows multiple users to share images and data, and discuss cases in real-time through a chat feature. Siemens Healthcare (Malvern, PA) showcased syngo.via, a RIS/PACS platform with advanced visualization tools. Distinctive in syngo.via is automated case preparation functionality, which loads images into the appropriate application and sorts them into the corresponding disease-specific layout, thus eliminating the need to manually choose the application, load data, and select corresponding layouts. (Figure 6). TeraRecon (Foster City, CA) launched iNtuition CLOUD, a cloud-computing solution for providing advanced visualization as an Internet-based service. Customers can upload their scans to the iNtuition CLOUD site, and then log in from any Mac or PC to access the full suite of thin-client iNtuition tools. iNtuition is also available for the iPhone, iPad, and iPod Touch. Vital Images (Minneapolis, MN) upgraded Vitrea Enterprise Suite (VES) with Version 6.0. The new version separates rendering, processing, and data storage to sustain quality service. Clinical features include Dynamic MR, XA 3D Angio, and Oncology Fusion, which allows users to visualize, quantify, and track tumors using fused CT, MR, PET, and SPECT images (Figure 7). Ziosoft Inc. (Redwood City, CA) introduced its PhyZiodynamics solution, an advanced visualization technology with superconducting algorithms that clinicians can automatically apply to the analysis of internal organs, vessels, tumors, and other regions of interest. It also enables radiologists to read from 2-dimensional to 5-dimensional views. Canon Medical Systems (Lake Success, NY) debuted its new wireless cassette-size digital radiography (DR) sensor system, the CXDI-70C, at RSNA 2010. The 510(k)-cleared device includes a standard 14-in 2 17-in image area and wireless transfer capabilities. Weighing less than 8 lbs, the system is designed to be easy to handle and to fit into existing Bucky trays. Carestream Health (Rochester, NY) announced the integration of its wireless, cassette-size CARESTREAM DRX-1 detector with Quantum Medical Imaging’s Q-Rad Floor Mounted system. The cesium iodide-based CARESTREAM DRX-1C is engineered to produce high image quality and improved DQE (detective quantum efficiency). FUJIFILM Medical Systems U.S.A. (Stamford, CT) rolled out the new FCR Go 2 at RSNA 2010. The system is equipped with a higher output x-ray generator designed to improve imaging of dense areas, such as the abdomen and spine, and bariatric patients. The new system features a full-size, 15-inch image display at the onboard workstation, enabling technologists and radiologists to preview a full-size image at the patient bedside, using a familiar platform. New tools for interventional radiologists being highlighted at the GE Healthcare (Chalfont St. Giles, U.K.) booth included the Innova 4100-IQ. The x-ray imaging solution is designed for image-based diagnosis and minimally invasive therapy for peripheral, oncological, and neurological imaging procedures. 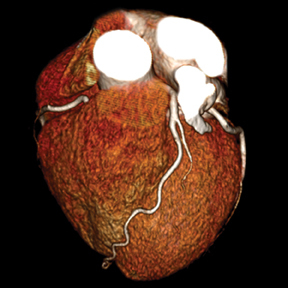 It uses CT or MR 3D image data to create a vascular map to better visualize complex anatomy images in fluoro mode. Addressing the need for flexible x-ray imaging in the emergency departments and intensive care units, GE also introduced FlashPad, a wireless detector that features two handles for easy positioning. The detector provides up to 8% more coverage for key applications and maintains high image quality at low dose levels. Philips Healthcare (Andover, MA) introduced the Juno DRF, a remote-controlled flat detector system that combines digital radiography and fluoroscopy applications. The system’s dual imaging mode is designed to accelerate workflow and increase patient throughput as well as to provide flexible room utilization. The DigitalDiagnost—ER wireless system from Philips Healthcare is a wireless X-ray system designed for the emergency room, trauma units, and recovery bays. Its rugged, portable detector, built-in handle, and cable-free design provide the flexibility to maneuver around patients and capture difficult anatomical views. Siemens Healthcare (Malvern, PA) highlighted the Ysio, a DR solution with a color touchscreen control. Ysio is available as a wall stand with an integrated detector; a wall and table system with a wireless detector (wi-D); or as a mixed detector solution for high throughput and flexibility. Its table supports up to 660 lbs and lowers to 21 in. Toshiba America Medical Systems (Tustin, CA) showcased its Infinix VF-i bi-plane vascular x-ray system with dual 12-in 2 12-in mid-sized flat panel detectors. 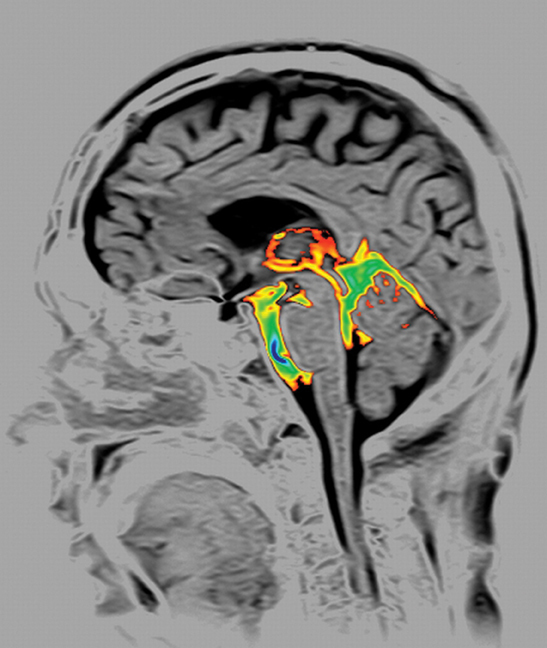 The wide FOV offers expansive coverage during bi-plane neuro and vascular imaging procedures on a broad range of patients, including pediatric. The system’s new processor provides Volume Navigation, a new 3D road mapping technique, in which an interventional fluoroscopic application fuses a 3D angiogram acquired on the VFi/BP configuration with live fluoroscopy. CoActiv Medical (Ridgefield, CT) has added new features to its web-based EXAM-PACS. They include a reception-desk scanning module, SCAN2PACS, which enables an imaging facility to digitize at check-in a patient’s hardcopy information, such as prescriptions, authorizations, insurance pre-certifications, or insurance cards. The company also introduced EXAM-Dictate, a tool that directly integrates Dragon voice recognition into EXAM-PACS and automatically attaches final reports to an exam once dictation is complete. 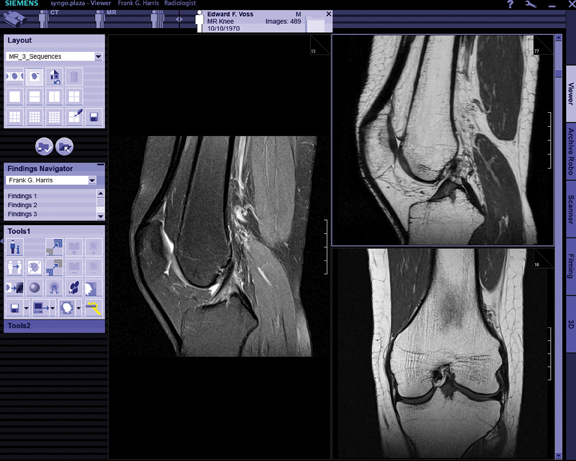 Centricity PACS version 3.2 from GE Healthcare (Chalfont St. Giles, U.K.), was showcased at RSNA 2010, boasting a feature set designed to optimize radiologist efficiency, enhance image interpretation, and enable growth from a PACS with a smaller footprint. lifeIMAGE (Newton, MA) served as another one of the digital clearinghouses in the 2-year, NIH-funded, RSNA and NIBIB developed, medical data sharing project. The company demonstrated at RSNA 2010 how it has integrated its on-demand image exchange network with Microsoft HealthVault, a platform designed to support personal health applications and services. Based on the RSNA Reporting Committee’s introduction of over 100 best-practices radiology report templates, M*Modal (Pittsburgh, PA) released a library of 70 templates it will integrate into its Speech Understanding platform. Users can document their own macros and templates while fostering the industry’s drive toward standardization and best practices for documentation. NEC Display Solutions of America (Itasca, IL) celebrated the 25th anniversary of its MultiSync brand. 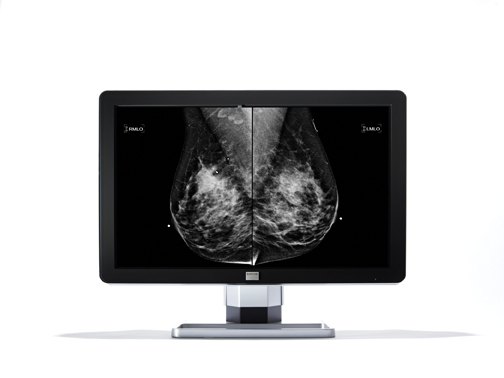 Designed exclusively for radiology, medical imaging, PACS, and mammography, the series of monitors includes 2-, 3- and 4-megapixel color displays, and 3- and 5-MP grayscale displays. Poiesis Informatics (Pittsburgh, PA) launched its Workflow Orchestration Suite, a collection of modules developed to create an optimized workflow experience for radiologists and other healthcare providers. The platform can leverage existing or best-of-breed systems and can connect these systems together for an optimized, context-specific user experience. nodules, which can now be automatically presented on the In Unison platform with CAD markings. CIVCO Medical Solutions (Kalona, IA) introduced its Super-Extended Length CIV-Flex Transducer Covers. The cover allows use of the transducer in scanning and needle-guided procedures for body surface and intraoperative diagnostic ultrasound while helping to prevent transfer of microorganisms, bodily fluids, and materials to the patient and health care worker during re-use of the transducer. The latex-free CIV-Flex cover is now available in 96-in length units, providing an extended sterile field from the array of the transducer to the transducer connector. Philips Healthcare (Andover, MA) showcased the iU22 xMATRIX Ultrasound, a new system that allows clinicians to create 2 full-resolution images simultaneously, capturing twice as much clinical information in the same amount of time without moving, turning, or rotating the transducer. Clinical trials show the solution speeds workflow. 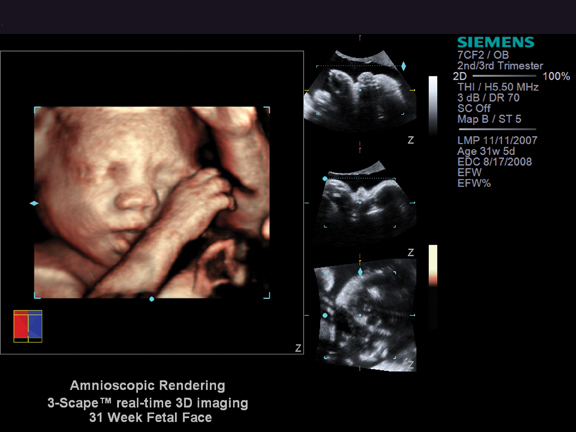 Siemens Healthcare (Malvern, PA) introduced real-time stereoscopic 3-D/4-D imaging capability as a work-in-progress on its ACUSON S2000 ultrasound system. The system integrates the new NVIDIA Quadro 2000 professional graphics solution that, with NVIDIA 3D Vision Pro stereoscopic glasses, enables users to view volumetric data. The platform is designed to improve communication between surgeons and patients and to aid in treatment or surgical planning (Figure 8). Toshiba America Medical Systems (Tustin, CA) highlighted several upgrades to its ultrasound platform. The latest features available on the Aplio XG, Aplio MX, Xario XG, and Viamo systems include new transducers, 4-dimensional imaging improvements, and workflow protocol enhancements. Additional upgrades to the Viamo include ApliPure, TissuePure Imaging and DICOM structured reporting. Zonare Medical Systems (Mountain View, CA) released new software for its z.one ultrasound platform, which includes color and 4-dimensional imaging capabilities. The company also released new transducers for musculoskeletal (? ), obstetric and vascular imaging. 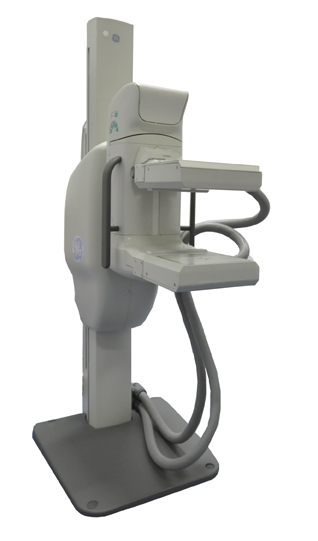 Carestream Health (Rochester, NY) announced it has received FDA approval of CARESTREAM DIRECTVIEW CR Mammography Feature. The computed radiography feature captures mammography images digitally and can be used in the same clinical applications as traditional screen-film mammography systems. The mammography option is available with the purchase of a new CARESTREAM CR system. FUJIFILM Medical Systems U.S.A. presented 3D Digital Mammography, a solution that presents stereo images of the breast that can be viewed at a workstation with glasses specifically designed to present a single 3-D breast image. The system uses the same workflow as traditional full-field digital mammography (FFDM). GE also debuted the Discovery NM750b Molecular Breast Imaging system. The system features a cadmium zinc telluride (CZT) detector, which employs a small FOV gamma camera that images the breast based on accumulation of a radioactive tracer in hypermetabolic cancer cells (Figure 9). The unit is FDA cleared for the assessment and early detection of breast cancer in high-risk women. The big news at the Naviscan (San Diego, CA) booth was the release of new data from an NIH-sponsored, multisite study of hundreds of women with newly diagnosed breast cancer showing that positron emission mammography (PEM) may reduce unnecessary breast biopsies. The study found that PEM had a 6% improvement in specificity at comparably high sensitivity, had 31 fewer unnecessary biopsies and, when compared to breast MR, had a 26% higher positive predictive value. Siemens Healthcare (Malvern, PA) announced the availability of the MAMMOMAT Inspiration Full-Field Digital Mammography System in the United States. The device offers digital screening and diagnostic mammography, stereotactic biopsy, and upgrade capability all in one system. Toshiba America Medical Systems (Tustin, CA) introduced women’s imaging configurations for its Aplio XG ultrasound system. The configurations include elastography, MicroPure for the identification of microcalcifications, a Dynamic Micro Slice matrix transducer for enhanced contrast resolution and image uniformity, and 4-D improvements to image all aspects of the anatomy more clearly and accurately. Dilon Diagnostics (Newport News, VA) showcased the Dilon 6800 Gamma Camera, which performs breast-specific gamma imaging (BSGI), also known as molecular breast imaging (MBI), and provides detection of small lesions. This diagnostic adjunct to mammography and ultrasound can be used for breast and other nuclear medicine imaging procedures. The company also highlighted GammaLoc, its FDA-cleared gamma-guided localization system for needle biopsy. This system enables BSGI-guided stereotactic needle biopsy procedures to be performed on the Dilon Gamma Camera. FUJIFILM Medical Systems U.S.A. (Stamford, CT) showcased work-flow improvements to Synapse 3D, a suite of clinical applications integrated directly with Synapse PACS and Synapse Cardiovascular solutions. Clinicians can access advanced diagnostic tools without having to use the same workstation. The platform is vendor-neutral, multimodality capable, and can be used with PET, CT, MR, and nuclear medicine systems. Its diagnostic clinical tools include multidimensional and dynamic data viewing, image fusion, and Sector MPR. Hologic Inc. (Bedford, MA) announced it has received an approvable letter from the FDA for the Selenia Dimensions 3- dimensional digital mammography tomosynthesis system. The system is designed to eliminate distortion caused by tissue shadowing or density. Hologic also announced it has signed an exclusive US partnership agreement with SuperSonic Imagine. Hologic will sell, install, and service the Aixplorer Multiwave breast ultrasound technology, which enables B-mode image quality and supports ShearWave Elastography, a tool designed to provide a real-time, color-coded map of local tissue elasticity. Konica Minolta (Wayne, NJ) unveiled Aeor DR, a new wireless digital radiography (DR) system designed for easy-to-use, high-quality imaging. The flat panel detector has a cesium iodide scintillator with a detector quantum efficiency level for high-quality images acquired with reduced x-ray dose exposure. The panel weighs 6.3 lbs and has a battery for extended life and short charge cycles. The detector is designed to fit existing wall stands and Bucky trays. Top technologies at RSNA 2010 drive personalized medicine. Appl Radiol.